People have been making portraits for a long time. 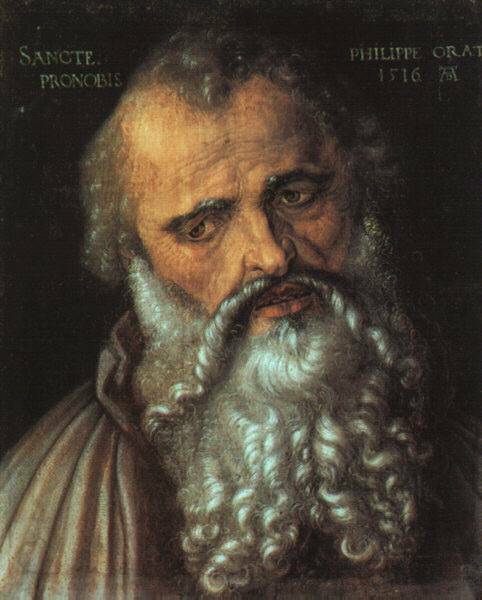 This painting of St. Philip was made in 1516 by Albrecht D ¼rer, a German painter. If you look at some of his other portraits you'll see examples of characteristics still common in modern portrait photography today. Here's a portrait of Kathleen from Tim_D's Flickr stream. It's one of the many portraits hosted on flickr.com. Notice how the light source is from the side of her face. This creates shadows and helps add depth to the image. You'll find the same technique was used in the painting of St. Philip. Also notice that Kathleen is not facing directly into the camera. She is turned about 45 degrees to one side. You'll also notice that the background in both images here is either blurred or is dark to focus the viewer towards the face. A busy background can detract from the subject so most portraits have soft backgrounds. One type of portrait photography is called environmental portraiture. In environmental portraits, the background and even props help tell us something about the subject. 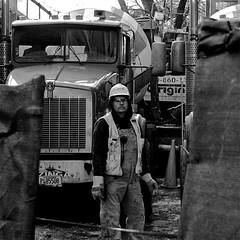 Mark Han** is a photojournalist and expert environmental portrait photographer. Take his quiz and see if you can match the portraits with the subject descriptions. Take a look at some of his best portraits for some more good examples. Sometimes you can create interesting portraits by cropping the photo. Here's a good example from Stephanie Deissner's Flickr Stream. This portrait adds a prop (the red towel) and even crops the face of the subject but the result is very effective. Be sure to take a look at some of her other work. Here's one more example where the image cropping was very effective and the background helps tell a story too. It's from Striatic's Flickr stream. Your first task is to LOOK at portrait photography. Look to discover how light, shadow, composition, background and environment all play a part in the creating of great photographs. Spend some time browsing through the portrait colleciton on Flickr.com and be prepared to share your favorites with your class. Now take a look at this portrait of Albert Einstein. How would you critique the use of lighting and composition? Is this a traditional portrait or an environmental portrait? You can read about portraits and view more in the Wikipedia.org portrait article.